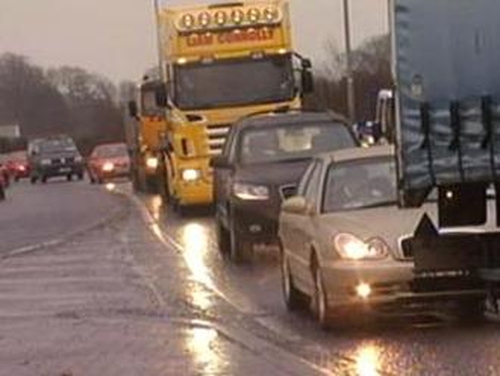 Heavy rainfall in Dublin has resulted in flooding in a number of areas and a number of collisions on commuter routes. Motorists are being advised to reduce speed, keep a safe distance from the vehicle in front and drive with caution. Motorists are also being advised not to drive through the flood waters. Dublin City Council said tonight it was advising motorists that there was serious widespread flooding in the Dublin area. It advised motorists to avoid any unnecessary journeys this evening. In Mulhuddart the Church Road is closed at the cemetery through to the Hollystown Golf Club. There is an open manhole at the Drumcondra/Home Farm Rd junction. Dublin City Council are en route to the scene. Motorists are advised to take care on approach. There is also an open manhole outbound on the Ballymun Rd outside the library. The bus Lane flooded as a result. Motorists are being advised to take extreme care on approach. The N3 at Blanchardstown is closed between the two exit slips which access the Blanchardstown Town Centre. Traffic is being diverted around the flooded area via the Snugborough and Mulhuddart interchanges. The left lane of the M50 Southbound at J5 Finglas is now closed due to flooding. There is a lot of surface water on the M50 at J4 Ballymun in both directions. There is flooding at the Strawberry beds approaching Lucan and on Tandys Lane in Lucan village. There is also flooding from the Old Swords Rd to Coolock Lane, and at the Griffith Ave Ballymun Rd junction. Heavy flooding is being reported on River rd in Finglas. Surface water and debris on the Killinarden side of the Killtipper Rd at a very bad bend is causing delays so motorists are advised to avoid if possible. On the Naas Rd outbound there is surface water after Newlands Cross and at the Kylemore Rd junction. There is also flooding in Donnybrook on Eglinton Rd. In the city centre there is flooding at Westland Row, Lincoln Place. In Louth, the R173 Carlingford to Newry Rd is flooded and impassable. Motorists should divert via Dundalk. Motorists have been advised of some disruption to traffic overnight to facilitate the upgrading of the M50. As part of the upgrade programme, N4 outbound traffic wishing to access the M50 northbound & southbound will be diverted to the Liffey Valley junction and onto the N4 inbound from where they can access the M50. This disruption will end at 6am tomorrow. And from 9pm tonight, the M50 southbound on ramp from the N7 outbound will be closed with traffic diverted via the N7 outbound onto the M50 southbound on loop from the Monastery Lane/N7 junction.